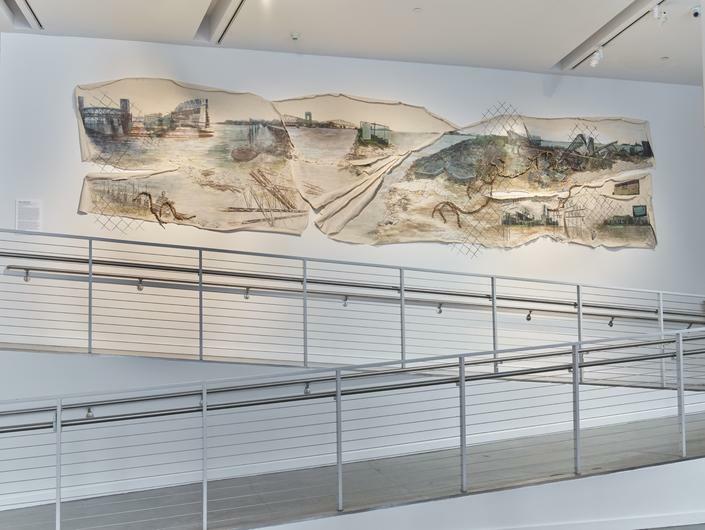 For the Bronx Museum’s lobby wall, Cunningham’s mural combines unexpected materials with photo-transferred images. 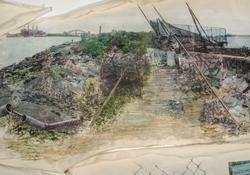 These images are layered with acrylic and pastel, revealing deteriorating remains of abandoned South Bronx waterfront areas, punctuated by multiple power transfer stations, railroads, and refuse transfer stations. 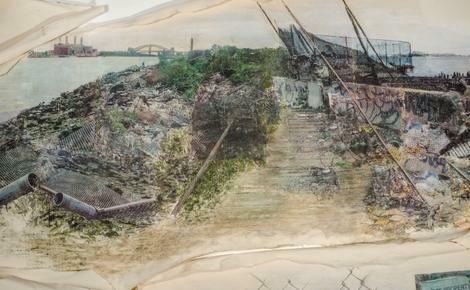 The torn edges of bifurcated sheets of canvas and shards of information provide a glimpse of the South Bronx’s complex history as a borough with industrial landscapes and greenery. 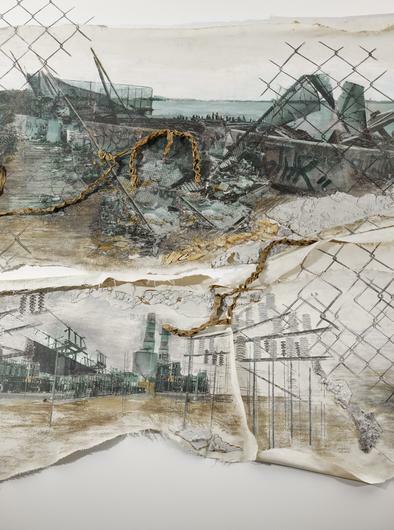 Linda Cunningham is a Bronx-based artist with a long local and international exhibition career. Her work has been featured at the Odetta Gallery, Bushwick, Brooklyn and the Harlem FLUX art fairs (2015 and 2016). Her 2013 installation in No Longer Empty’s “This Side of Paradise,” at the Andrew Freedman Home was installed in 2014 at the Bronx Museum in an exhibition sponsored by the Bronx Arts Alliance. The Bronx Museum also displayed her sculptural installation “Urban Regeneration” on its terrace (2009/2010). 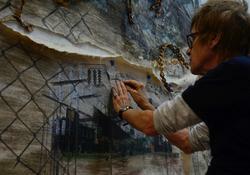 Cunningham received a Fulbright Senior Research Fellowship in Berlin and her monumental public sculptural installations and alternative memorials are permanently sited in Cologne, Kassel, Bad Hersfeld and Cornberg, Germany, as well as Grounds for Sculpture, Hamilton, New Jersey, and City of Sculpture, Hamilton, Ohio. Recent temporary public sculpture installations were at Westchester Square, Bronx, New York, and alternative memorials were formerly at the CUNY Graduate Center, New York, New York (1989-1995), and in Tribeca and the United Nations Plaza, New York (1997-1998). Linda Cunningham South Bronx Waterfront Sagas is made possible in part by the support of the Bronx Council on the Arts’ Bronx Recognizes its Own (BRIO) stipend.